For Frank Lloyd Wright, Japan was a muse and possibly a savior. The architect's love of ukiyo-e woodblock prints is well-known. But his 1917-22 residence in Japan, where commissions such as the Imperial Hotel helped revive his flagging career, is not so widely documented. Nor is his huge influence upon generations of Japanese architects. So a tour of Wright's Japan—the place where he regained a foothold on the way to becoming "the greatest American architect of all time" (according to an American Institute of Architects survey)—offers fascinating insight into this eccentric genius. Wright's 1890s Prairie Style homes sparked the first revolution in architecture since the Renaissance, and marked the architect's first golden age. He would go on to design several iconic American buildings—from the 1936 Fallingwater house in Pennsylvania to the spiraling Guggenheim Museum in New York City in 1959. But at the time he arrived in Japan in 1917, the then-50-year-old was a former wunderkind, dragged down by a scandalous affair and tragedy. His obsession with Japanese prints began before that, in the 1890s. An art form that dates back to the mid-1600s, ukiyo-e or "pictures of the floating world" include images of fashionable courtesans, Kabuki stars, landscapes and everyday life with architectural exteriors and interiors of the day. Wright's collection ultimately became the key to his financial survival—he used the prints as a struggling heir might use the family jewels, to settle his debts in difficult times; he always bought more when he was flush. After his death in 1959, they helped provide the $750,000 his Taliesin Foundation owed the U.S. Internal Revenue Service. But while he called them his "king's ransom," the prints were more important for the inspiration their beauty—and geometry—provided. "I remember when I first met Japanese prints, I'll never forget it," Wright once said in a filmed interview. "Japanese art had a great influence on my feeling and thinking." Wright's first encounter with Japanese architecture was probably the country's pavilion at the 1893 World's Fair in Chicago. A wooden copy of the Byodo-in Temple in Uji on the outskirts of Kyoto, it was built by carpenters from Okura & Co., which 20 years later would finance and build Wright's Imperial Hotel. Baron Kihachiro Okura, head of the firm, became one of the architect's staunchest supporters, despite mounting criticism as construction costs for the hotel climbed to an extraordinary $3 million. "The reason why everyone says Wright was so influenced by Japan—and scholars have been arguing this for nearly a century—is because so many aspects of his philosophy of 'organic architecture' are also characteristics of Japanese traditional architecture," says filmmaker and Wright scholar Karen Severns. Wright favored natural, local materials, warm earth tones, human scale and integration of interior and exterior, all of which fit with Japanese tradition. He "borrowed landscape," using windows or doorways like picture frames—a concept the Japanese call shakkei. Even his fascination with geometric shapes is in keeping with the rectangular straw tatami mat, the base of Japan's traditional architecture. 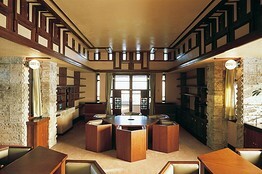 But his open plans, where space flows from room to room, are completely outside Japanese tradition. 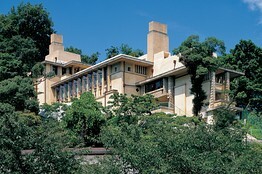 "Wright fused East and West. And he loved the element of surprise," says Ms. Severns. "You'd go down a corridor with a low ceiling and then come out into an open expanse and, 'Oh, wow!' you'd say. That's something you don't often get in a Japanese building. He had this mastery of space." 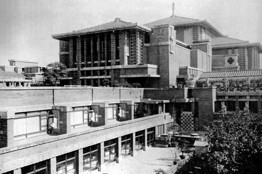 Among Wright's 14 designs for Japan, six were built. Of those, Jiyu Gakuen Myonichikan, a 1921 building in Tokyo, and the Tazaemon Yamamura House (1918-24) near Kobe remain standing. His Imperial Hotel was demolished in 1967, but the main lobby exterior and interior was transported to Meiji Mura, an architecture theme park near Nagoya, and the Old Imperial Bar in the current Imperial Hotel retains some of the architect's original design. 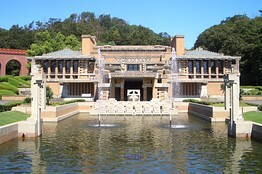 Many more structures throughout Japan were designed by Wright's apprentices and followers, both Japanese and foreign. In central Tokyo alone are 26 buildings directly related to Wright, though most are not open to the public. Ms. Severns and her partner Koichi Mori offer tailor-made Frank Lloyd Wright tours in Japan through their company KiSMet Productions. I took a two-day tour that began at the intriguing Jiyu Gakuen Myonichikan—"myonichikan" meaning "house of tomorrow" and Jiyu Gakuen ("School of Free Spirit") being a progressive school for girls founded by Motoko and Yoshikazu Hani. The Hanis met Wright through Arata Endo, chief draftsman for the Imperial Hotel, who shared credit on the school design with Wright—a first for the American. Endo became his devoted collaborator and, after Wright left in 1922, his lifeline to Japan. Designed on a strict budget, Jiyu Gakuen features Wright's trademark low-rise symmetry, clean, minimalist lines and simple, elegant adornment. Walk through the main entrance down a low-ceilinged corridor dimly lit with natural light and step up a brief flight of stairs into the split-level dining room, a breathtaking expanse of open space. Windows flooding the rooms with light are decorated with geometric shapes. Wright and Endo's chair and table designs, sized for children, sit in the room, and their sculptural pendant lights hang from the remarkable "ship's-hull ceiling." The porous volcanic oya stone used in the fireplace was a favorite material for Wright, figuring in all his Japan structures, but it was a controversial choice—and as feared, it is crumbling with time. The school was registered as an Important Cultural Property in 1997—after a long battle—and then restored over three years. In the tony shopping district of Ginza there are structures designed by three of Wright's many followers. Our first stop was the Sapporo Beer Co.'s Lion Beer Hall—a virtual temple to beer—where we bravely nibbled a lunch of German-inspired sausages, washed down with generous mugs of yes, Sapporo beer. Designed by Eizo Sugawara in 1934 with elements of Gothic, Art Deco and Wright homage, it miraculously survived devastating earthquakes and World War II bombings. Orb chandeliers, emerald green tiles, a Gothic ceiling and colorful glass mosaics—including the 30,000-piece wheat-harvest scene with its bare-breasted peasants above the bar—made our visit akin to a Wrightian communion. "Most everything is original, even the floors," says Ms. Severns. "In Japan, this is something to be treasured." A few blocks away, ready for more blessed sightings, we viewed the Christian Literature Society and the American Bible Society, two connected buildings designed in 1926 by Czech architect Antonin Raymond (1888-1976). The boxy '30s-style concrete modernist structures are remarkable mainly because they haven't been torn down and replaced—the real estate beneath them is some of the most valuable on the planet. Some small gems remain within—Raymond's office, for instance—but it's the story of the architect and his artist wife, Noemi, that's most intriguing. "The Raymonds helped pioneer modern architecture and interior design in Japan," explains Ms. Severns. The couple came to Japan with Wright to work on the Imperial Hotel, but left the project after one year. Raymond went on to create a highly successful practice in Tokyo, Raymond Architectural Design Office, which continues to operate. 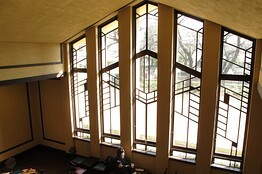 He moved toward the modernist style, slowly paring away Wright-style beautification and ornamentation. Just five minutes away by foot, the Miharabashi Center Building was designed in 1952 by another Wright apprentice, Kameki Tsuchiura (1897-1996). Sadly, this crumbling modernist survivor appears destined for the wrecking ball. Designed like an ocean liner (a favorite architectural conceit of the '30s—and of Wright) with a hull-like underground arcade, it straddles a major Ginza roadway. The aboveground sections are topped like the bow and stern of a ship with delightful Wrightian details. At the Imperial Hotel, a 10-minute walk away, we quickly settled into comfy leather chairs and basked in the 1920s Art Deco mood of the Wright-designed Old Imperial Bar. It was once known as the gentlemen's bar, and fine malt whiskeys and cigars are still the fashionable choice. Wright elements from the 1923 hotel, such as a section of mural with flecks of gold leaf and terra-cotta tile grillwork with lighting that casts a soft yellow light behind the bar, quietly illuminate the hotel's glorious past. More of this past has thankfully been preserved at Meiji Mura, about an hour outside Nagoya (three hours from Tokyo). The hotel's exterior does not disappoint. It is Wright's classic symmetry, embellished with original "scratch tile" (a relief tile Wright created with local tilemakers) and oya stone carved into magnificent Mayan-like forms. The reflecting pool, however serene, still ripples with the memories of the Great Kanto Earthquake that struck Tokyo at 11:58 a.m. on Sept. 1, 1923, as guests gathered for the hotel's grand opening. The quake destroyed most of the city, but the hotel withstood the shock, and then survived the fires that followed thanks to the water in the pool. All inside survived and the hotel became a refuge. 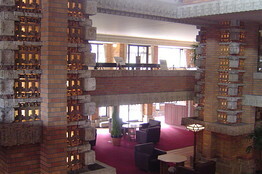 Wright was celebrated for his magnificent earthquake-conscious design. Onward to our last stop, two hours by train from Nagoya: Yamamura House (now the Yodoko Guest House) at the foot of the Rokko mountain range in Ashiya near Kobe. Endo again shared credit with Wright for the design. With breathtaking views, and representing the best of Wright's distinctive charm and sustainable "organic architecture," it was saved as an Important Cultural Property in 1974. While Wright's legacy has continued to influence generations of Japanese architects (Kengo Kuma is one recent example), he also inspired those who lived in his homes. American Stephanie Tansey resided in the Yamamura House from 1956 to 1967, starting when she was 6. Growing up in the house "helped make me who I am today," she wrote by email from Beijing. Ms. Tansey has worked for years with the Earth Charter Initiative, which seeks to build peaceful and sustainable communities. "Living [there] enabled me to know what 'real' is," she explained. "I learned what it means to live in sustainable harmony with nature."